There seems to be some interest in global sea level as estimated by tide gauges. 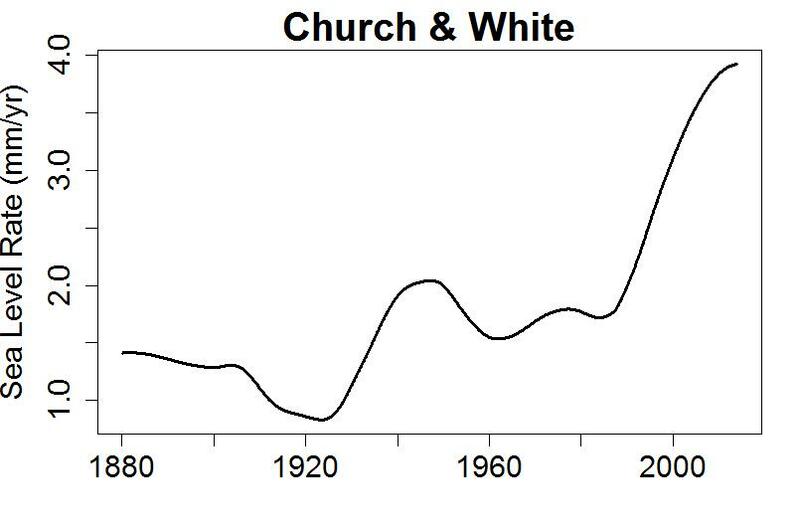 In particular, we have recently been directed to a graph of the data from Church & White, which is the most reputable of the available choices. 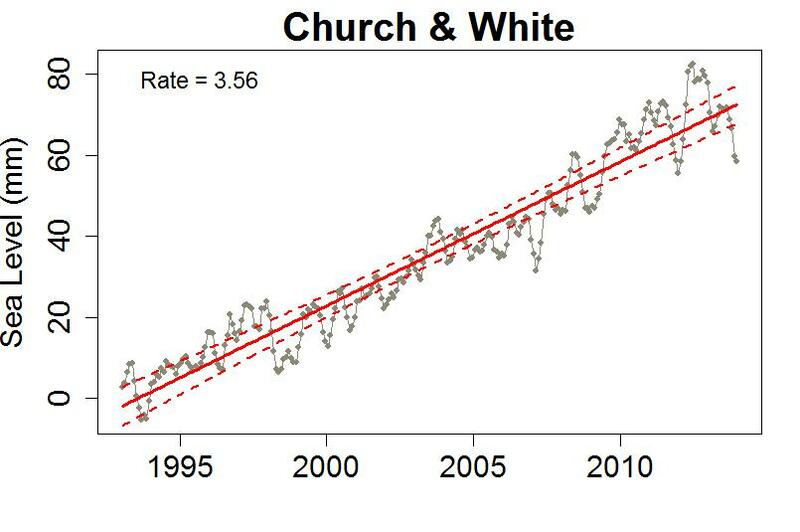 Alas, the graph we were directed to only shows their data up to the end of 1992. What, you may wonder, happens after that? Do bear in mind that the difference (from the satellite-based estimate) isn’t statistically significant. Essentially, they agree (certainly within their uncertainty limits). The pattern of acceleration and deceleration is now evident. Especially prominent is the recent upswing, a sign of the acceleration that has happened recently. 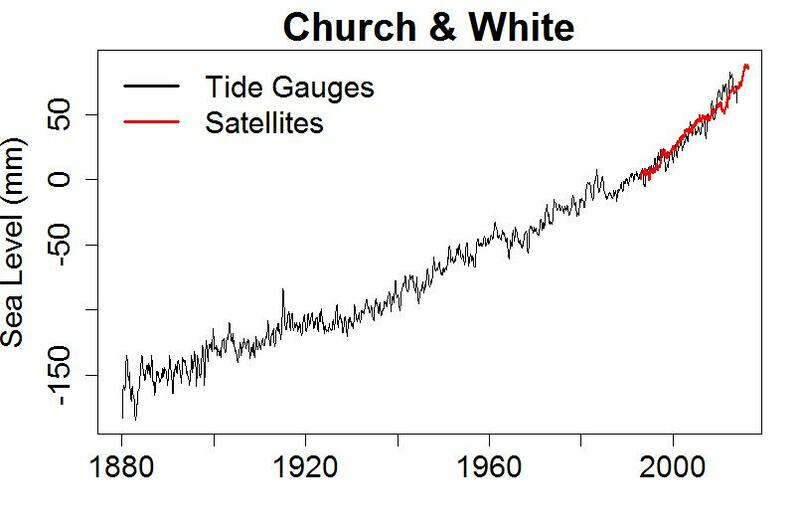 It’s rather apparent that the rate has gone both up and down (both acceleration and deceleration of sea level), but that recently we’ve seen a sizeable increase in how fast the ocean is rising. But even without acceleration, the present rate is real trouble. Miami is already spending about half a billion dollars to deal with the flooding they’re already getting from sea level rise. Another foot will bring yet more damage, and threatens the economic viability of somewhere in the neighborhood of a trillion dollars of prime real estate development. Of this we can be certain: deniers will continue to declare “no acceleration” based on shoddy analysis or, more often, none at all. Meanwhile, the sea will continue to rise. individual sites” (Haigh et al 2014, DOI: 10.1038/ncomms4635). Mr. Wakefield argues that because we can’t yet see clear acceleration in every local record, the acceleration in global sea level must be bogus (or at least unproven). I think this argument is clearly invalid. This, BTW, is precisely what we see in tobacco. Studying individual records made showing the tobacco-cancer causal connection very difficult to see. Studying aggregated records of thousands upon thousands of cases made the process much easier. Of course that did not keep tobacco denialists from saying that since no particular case could be 100% quantified to be caused by tobacco and tobacco alone that any regulation of tobacco on public health grounds was unwarranted. OP: “certainly within their uncertainty limits”. You meant to do that, didn’t you 8^D? What happens if you do the same analysis with Jevrejeva 2014? Because I know you would get the opposite results. Uhmm, just how do you know that, plazaeme? When are you publishing? Tamino: Let’s consider the acceleration of SLR shown in your last graph. SLR increased from about 2 mm/yr to 4 mm/yr (cm/decade) over about the last 4 decades. That gives an acceleration of about 0.5 cm/decade/decade or 0.2 inch/decade/decade. I find the use of the unconventional units of inch/decade/decade useful because SLR in the satellite era (latest revision) averaged 1 inch/decade (2.5 cm/decade) and we need an acceleration of 1 inch/decade/decade to get in the vicinity of 1 m of SLR by 2100. These round numbers are easy to remember and inches of SLR per decade are tangible changes non-scientists can understand. (For 1 inch/decade/decade, starting in the 2010’s = 44 inches of SLR; starting in the 2020s = 35 inches of SLR). So, IF a quadratic model is appropriate (a debatable assumption), the acceleration we have experienced over the last four decades is only about 1/5 that needed to produce 1 m of SLR this century. If we use 4 mm/yr (1.6 inch/decade) as the current rate and accelerate at 0.2 inch/decade/decade, SLR will be 3 inch/decade after 8 decades and total SLR will be 20 inches for the century (about double the 20th century). Therefore, the current level of acceleration (if it is statistically significant) produces the IPCCs central estimate for SLR. 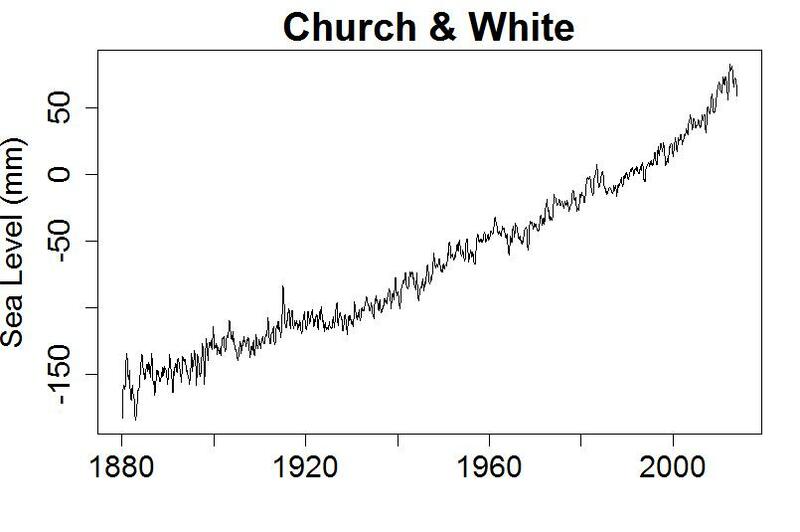 There are a large number of caveats associated with this extrapolation, beginning with the fact that acceleration has been highly variable was almost as high during the 1925-1945 period as it was over the last four decades (:)). However, using the simplest model (quadratic), acceleration is still far below that needed to produce 1 m of SLR by the end of the century. [Response: Extrapolating either a linear or *quadratic* trend to the end of the century is downright foolish. Just dumb. Part of the problem with extrapolation is that SLR consists of both thermal expansion and ice melt. The latter contribution is accelerating *easily* fast enough to imply metres of global sea level rise by the end of the century, if it were to continue. Steady now!! Talk of an “easily accelerating ice melt contribution” is a bit out of date these days. 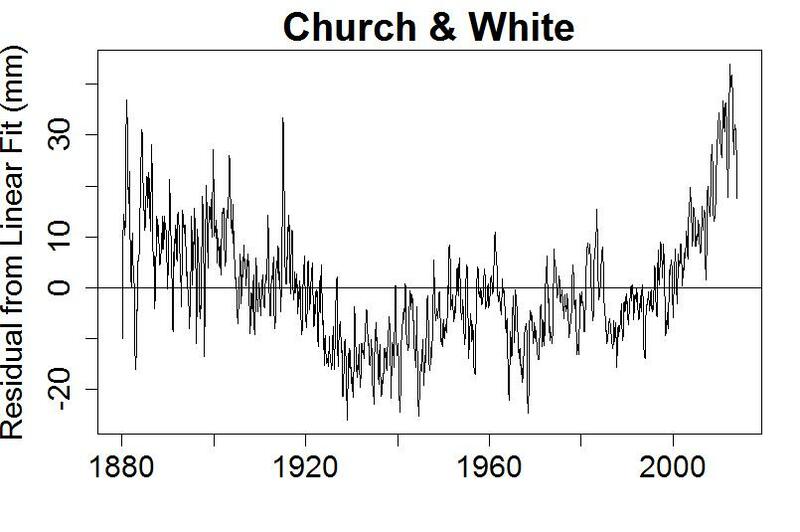 (See Figure 30 in Hansen et al 2016) Data from Grace shows the acceleration from Greenland that yielded melt equivalent to 1¼mm/yr SLR by 2012 has been wobbled away in the years since. And the wobbly acceleration still evident from Antarctica has been up to now the junior partner in SLR creation. I see two problems with the lines extrapolating the Greenland & Antarctic melt rates in that Figure 30. Firstly, the extrapolation of these melting rates is a bit too adventurous for me. They depend on mundane factors like snow fall, ice melt, ice flow, SAT & SST, none of which should be lightly extrapolated individually. So collectively it would be ill-advised even to start extrapolating. The second problem concerns the possibility of multi-metre SLR this century. In my understanding, with one exception, the science is providing no credibility for multi-metre SLR this century (although it will be a sure thing in the following century under strong AGW). The worrying exception is Hansen’s hypothesis set out in Hansen et al (2016) which requires massive heat transport to the poles to allow massive ice melt and SLR. 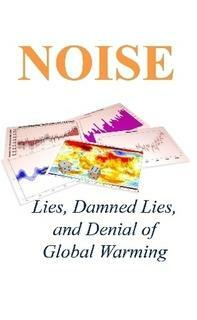 To achieve this SLR, the global warming bit of AGW stalls in a very obvious way. While deluded denialists may jump for joy at the prospect of a grand hiatus in the rise of global average temperatures this century, it is what Hansen’s hypothesis requires and that is a future which no sane person would want to wish on humanity.